to the current changes within the industry in response to Google’s new ad regulations. 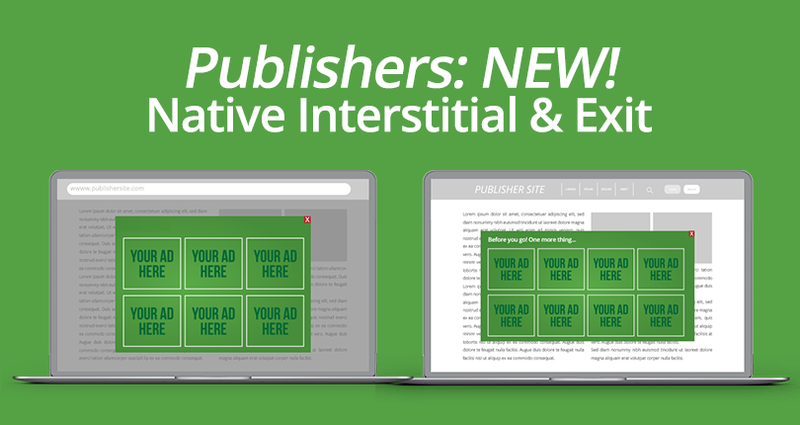 We have further developed our Native advertising widget to include 2 brand new formats. Appears as a smooth transition from the side of the page. Full screen format which overlays the content page with contextually relevant ads. Can be closed immediately and easily by the end user in compliance with Google. Compatible with Desktop and Mobile. Take advantage of this format by monetising site users as they leave the site. Triggers when the user moves the mouse outside the page/goes to close the browser tab. Better Ads Standards state: Exit Pop Up Ads are allowed because they trigger when the user starts to leave the page, or purposely navigates to another tab and then returns to the open page. Avoid over capping: Once every 24 hours appears to generate good results for both publishers and advertisers. We recommend a maximum of once every 3 hours, depending on the visit length. Subcategory: Don’t set up a specific Subcategory, unless the audience is Gay. Native allows publishers to avoid banner over-saturation by using an alternative format, and because Native integrates well with the content of a site, it gives extra value for the user. Provide transparency to users by clearly labelling Native advertising as being promoted or sponsored content. Try eliminating low performing banners and replace with our original Native Display format and test Native ads on different pages and in different positions, then track and compare results. All ExoClick’s Native formats are fully aligned with Google regulations as well as being carefully designed to follow the Better Ads Standards.